This is the dish that inspired Chef Juje! I tried this dish for the first time a few months ago, back when I was *just* learning to cook and before I discovered online cooking classes or blogs or basically anything that would help me along my way. I didn’t know how to heat a pan and was afraid of using oil and my patience was even shorter than it is now. Too funny. In all honesty, the future-Mr. said this only to encourage other methods of cooking that he has found success with (he is a great chef as well!) and he by far is Chef Juje’s biggest fan (and beneficiary!). But he quickly learned that “maybe you shouldn’t…” translates to “you must run out and buy a new pan and master this skill immediately.” I became mildly consumed with this new technique and we’ve been eating a lot of pan-fried foods ever since. So here we are. 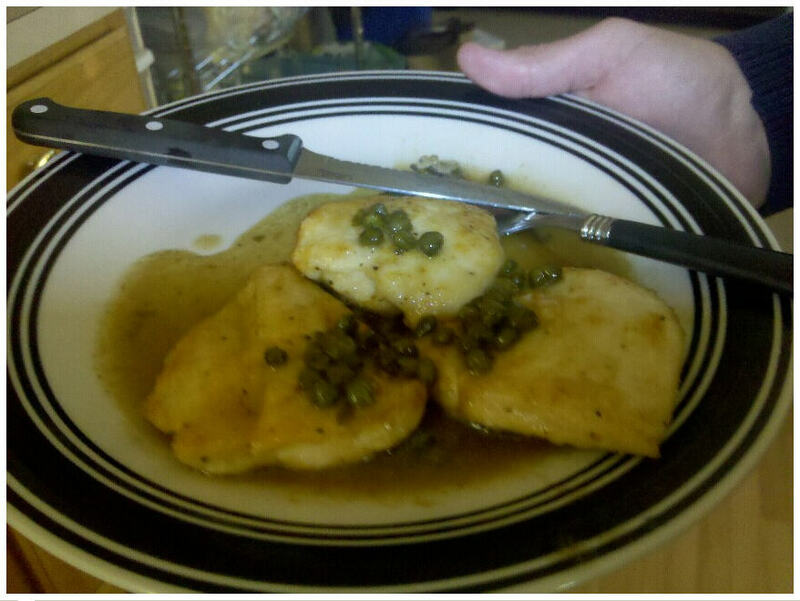 Last night’s chicken piccata attempt was much, much more successful. Feedback from last night? “Do you mind if I eat the rest of it?” Mind? Did I mind?! I was THRILLED! I don’t even care that I am eating an overpriced, under-tasting salad from our cafeteria right now because there was no more chicken left for lunch. Other side as a more golden/crispy crust. Higher heat may help too. The recipe I used calls for brined capers, wine and lemon juice as the pan sauce. It was slightly too tart for my preferences so I may switch to using stock in place of wine next time. Also, as the caption indicates, the chicken didn’t get as great of a crust as it did for the first side of the first batch. 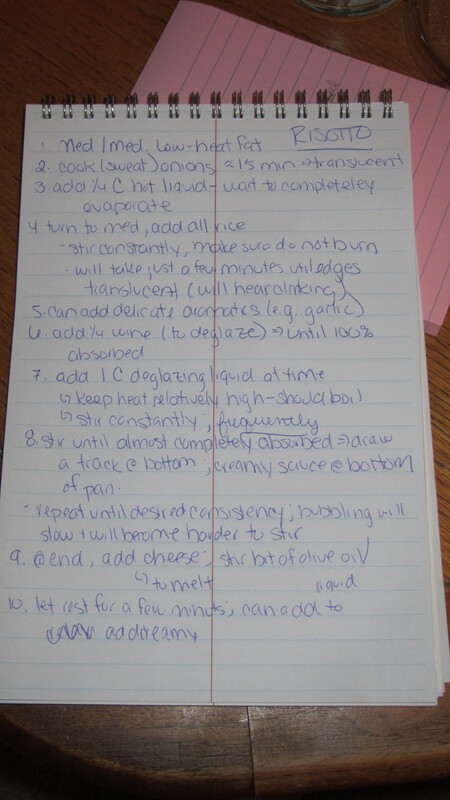 For the recipe itself I direct you to Simply Recipes, since saying I “adapted” it would be a total lie and the author provides a lot of insight. For now, I have a few helpful hints. Chicken: I used thinly-sliced chicken breasts that I then cut in half. For some reason, working with smaller pieces of chicken just works better for me. I would love to be able to use the cheap-o $1.99/lb giant chicken breasts at some point. Heating oil/butter: The first time I added the oil it started smoking immediately. This is a sign that the pan is too hot. I discarded the oil, wiped the pan and began again over lower heat. You don’t want burnt oil to affect the flavor of your dish. Adding wine/stock: Be careful when adding wine or stock (particularly wine) to deglaze the hot pan. I removed the pan from heat to do this. When I cook it’s still me against the fire alarm and I’m not taking any chances. When is sauce done? I typically wait for the sauce to have a kind of (ha) sauce-like consistency. I take a wooden spoon and draw a line through the sauce. If the line forms but then is slowly covered up by the sauce, it is perfect. If no line forms, it’s not reduced enough. If the line stays for a while, it is over-reduced and I add more water. Adding butter to sauce: Butter is added to the sauce to add shine and richness. I learned that butter should be cold so it mixes with the sauce — room temp butter might curdle in the sauce. I did not learn this first hand (thank goodness) and I don’t want you to, either. My first attempt at risotto was a giant, giant, GIANT fail. I thought I was doing everything right but an hour into the process the rice was still not absorbing any of the liquids. Frustrations grew high, patience grew short and our stomachs growled louder and louder. I didn’t get it. I tried SO HARD to do this well and all I got was tough rice in chicken stock. For better or for worse I am not one to let things go so the following evening I embarked on my second adventure in risotto. Future Mr. Chef Juje was away so I slyly headed back into the kitchen, computer and Arborio rice in tow. I studied my rouxbe video, took copious notes and totally psyched myself up for this next attempt. I’m nothing if not passionate. Guess what?? For as much as the first attempt was a fail the second attempt was a big success! I just used onions, rice, stock and garlic, then finished with mascarpone at the end. I actually ate it so fast that I forgot to take a picture while it was still in its prime (riosotto doesn’t hold well for long). The future-Mr. even brought it for lunch the next day. It says a lot when something I cook is better than the smorgasbord — plus milk — he can get for $2.50 at work. I posted this to my facebook but I think it’s worth restating here. Somewhere along the line in becoming a grownup I got the strange idea that things should come easily. That if you try your best the first time you should succeed. I’m glad that’s not the case. As I learned here, sometimes – no matter how hard you try, no matter how much you study the recipe or read blogs or consult with others — you’re going to need to just try it again. And maybe again and again and again.